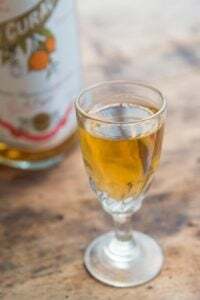 When I was in Nice a few months ago with my friends Adam and Matt, I wanted to show them some of the more unusual local specialties, ones you wouldn’t come across unless you were actually in a certain region. French cooking is very regional, which is why you won’t find bouillabaisse in Paris or all that many macarons in Nice. And a lot of people visiting a certain town or city might not be familiar with some of the more unusual things that are only available there, like Socca or Panisses, simply because no one would think about eating them outside of the area where they originated. In case you’re wondering, you can’t make a Tourte de blettes without Swiss chard (blettes). 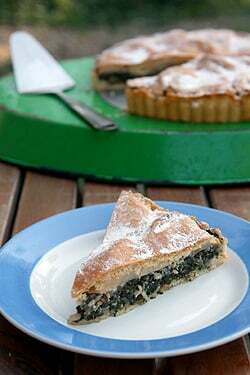 For one thing, if you did, then it wouldn’t be Swiss chard tart. So get that notion out of your head right now. And believe me, if you can’t find chard, I feel your pain. One fine morning at the market, I bought my big, beautiful bunch of chard from a big pile at the market to make this tart. Then after cooking it down, I deduced that I needed more, a revelation which came after the market had packed up for the day. Well, I kid you not..I searched through eight supermarkets and three specialty produce stores in my neighborhood looking for Swiss chard (and one frozen food shop as well), and didn’t find a single leaf. One vendor tried to convince me that bok choy was “Italian” Swiss chard—but I wasn’t buying it. So the next morning, I trudged up to another market not in my neighborhood, near rue Oberkampf, and found it. I don’t know what the moral of the story is, and although I’ve seen similar sweet tarts in Italy made with a variety stewed greens, called Torta di Verdura, I wanted to stick with the classic. And I don’t think that they make tarts with bok choy in Italy. The Swiss chard I got was so big, I had to clean it in the bathtub (not to worry, I cleaned it to surgical standards before I gave it a wash). 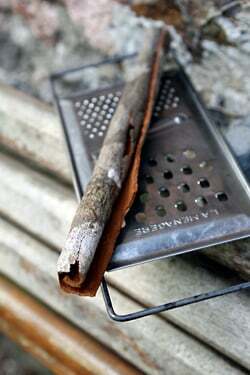 And speaking of big, I had these enormous shards of cinnamon that my friend Diane gave me a while back that I was waiting to use, and the spiciness of this Vietnamese cinnamon was so alluring when I grated it that now that I’ve used it, I’m wondering what the heck took me so long to finally grate it up? You probably don’t need me to tell you that this tart isn’t for everyone. (If you’re one of those people, thanks for reading at least this far.) It’s not super-sweet and has a bit of Parmesan cheese in it, plus the dough made with olive oil instead of butter. But it sounds odder than it tastes, and folks make sweet desserts with vegetables all the time, such as Carrot Cake and Sweet Potato Pie, so it’s really not that much of a stretch, my friends. I’ve seen Tourtes de blettes with apples tucked in there, and sometimes not. I used them in this one because I was apple picking this weekend and had an overabundance—to say the least, of apples to use up. (Why couldn’t I go Swiss chard-picking?) 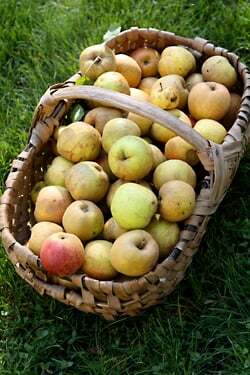 Although the two apples I used hardly put a dent in my basketload. The tree I climbed to get these apples wasn’t marked anywhere telling me what kind of apples they were. But these were apples that were more croquant (crisp) than traditional baking apples, the kind that get squishy soft when you cook them. (But hey, they were free. So I wasn’t complaining.) But I recommend that you use apples that will cook until they’re nice and soft if you can. The dough can be a bit tricky to roll, so I roll it between two sheets of parchment paper. It won’t look like a museum piece when it’s transferred into the pan, but you can use your hand to press it into place. And no one is going to see the bottom, except for real sticklers, but who wants to feed those kinds of people anyways? Because I learned that all Swiss chard is not created equal, I gave a weight equivalent for the leaves. Whenever I have leftover chard stems, I sauté them in olive oil and salt, until wilted, then freeze them to add to my next batch of Soupe au pistou. Any extra leaves can be added to that as well.I used unrefined cane sugar for the filling, since I like the slightly caramelized taste it adds, but you can use regular sugar if you wish. If you don’t have a tart pan, a springform cake pan will do. 1. Make the dough by mixing together the flour, 1/3 cup (65 g) sugar, baking powder, and salt in a bowl. Add the olive oil and the eggs, mixing until the dough is smooth. 2. Divide the dough into two pieces, one slightly larger than the other, wrap each in plastic and shape the two dough portions into disks. Chill for at least one hour. 3. Wash the chard leaves very well, in several changes of water, until the water is clear and there is no grit in the leaves. 4. 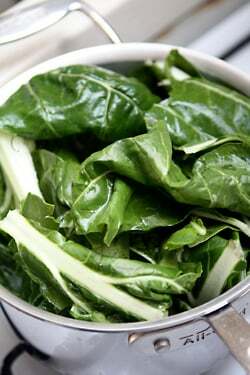 Put the chard leaves in a saucepan with a bit of water and a pinch of salt. Cover, and cook the leaves until they’re completely wilted, about 15 minutes. 5. Drain the leaves and run cold water over them, turning them as you rinse. (This ‘shock’ helps set the color.) Once cool, squeeze the leaves very, very firmly to extract as much water from them as possible. 6. Put the raisins in a small saucepan and pour just enough eau-de-vie or brandy over them to cover. Simmer for a minute or two, until the liquor is absorbed. Let cool to room temperature. 7. Chop the Swiss chard and put it into a medium bowl. Coarsely chop the raisins and the pine nuts, and add them to the chard . Stir in the cinnamon, Parmesan, and 1/2 cup (100 g) sugar, then mix in the eggs. 10. Dust both sides of the larger pieces of dough and roll it between two large sheets of parchment paper. About halfway through rolling, peel away the parchment and re-dust both sides of the dough with flour, then continue to roll the dough until it’s the size that will fit into the bottom of the tart pan and go up the sides. 11. 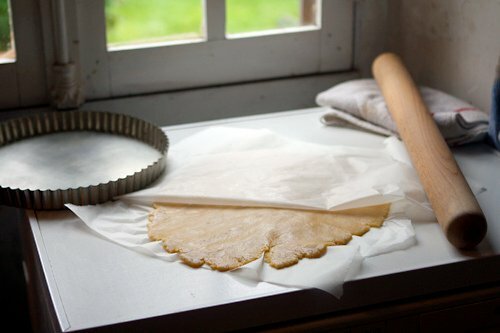 Peel away the top piece of parchment and carefully overturn the dough on to the tart pan. Peel away the other piece of parchment and use your fingers and the heel of your hand to smooth the dough into place and even it out. 12. Spread the filling into the tart pan over the dough, then peel and thinly slice the apples, and lay them in an even layer over the Swiss chard filling. 13. Roll out the other disk of dough as you did the lower one, between two parchment paper sheets, and transfer it to the tart pan to cover the tart filling. 15. Bake for 30 to 40 minutes, until the dough is golden brown on top. Remove from the oven and dust the top with powdered sugar. Note: I made this dough originally using American flour and found it came together fine without the milk. But when I made it with French flour, which is softer and milled finer, it needed a bit of milk to bring it together. A few commenters also noted that the same, so you may need to add a few tablespoons of milk to the dough if it appears dry and isn’t coming together. I love tourte aux blettes! Here’s a picture of my Tourte aux blettes. My recipe doesn’t have cheese in it, but it has egg, which binds things in a lovely way. oh, never mind… Now I see the eggs in your recipe too. I think this makes a wonderful main course, btw. I have to admit, that I am not good with pastry. My mother is an excellent baker, and her crusts are spectacular. I wish it were genetic! I will keep trying though. They certainly taste good, even if they are ugly. There is a French word for beautiful-ugly… I can’t recall. That is what my pastry is like… Beautiful (tasting)-ugly. However, I do have my own garden, and I am good at that. So, I have lots and lots and lots of chard in a rainbow of colors. That alone will push me to try this, even if you yourself say it is difficult to roll. If it’s ugly again, who cares. I will eat it myself! Thank you for the recipe and always-beautiful photos! Wow–Swiss chard and apples! I would have never thought! I’ll have to try this out of shear curiosity! I tried your simple tart crust recipe last night and it was an outstanding success. Since I usually use some variation of wholewheat flour, most of my pastries are difficult to roll anyway. I can’t wait to try this… maybe tonight? 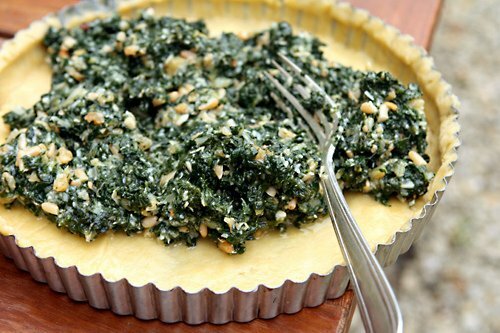 Hmmm I would never think of using swiss chard in a tart. I would have never thought to pair Parmesan cheese and sugar, althought I bet it does go very well with the apples. Does this tart have a savory/sweet flavor to it? Looks delicious as usual. mm this sounds like a really tasty sweet and salty combo! i’m always looking for ways to use chard, great recipe! Your tart looks so delicious! I’m really curious about the taste – chard, parmesan, apples and sugar. Could definitely be a success although it sounds a bit weird first. But when you start to think about it you can imagine how they could make a really nice combination! The remaining problem is: where to find (monster-sized) chards? Have to go and look at our farmers market but chard isn’t the easiest vegetable to find around here. Thank you for sharing! It was, again, such a joy to read your post. 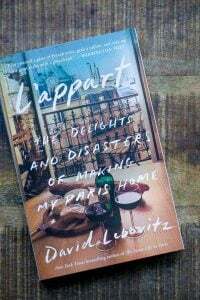 Thanks, David, this is on the menu list for next week with friends who are adventurous eaters. The aside about veggies in sweet things got my attention as I made the (yummy!) zucchini bread with the lemon topping you posted for several friends and others who could NOT believe it was zucchini (or courgettes, since they were British attached). I’ve done that twice since and will do it again for my wonderful market vendors for Christmas this year. I love Swiss chard and think it’s terribly under-appreciated in America, at least here in the Midwest. Thanks for suggesting a terrific way to prepare it! DARN, I was hoping for a savoury recipe. I’ve been thinking about making chard into tarts. But good inspiration… Maybe just leave out the apples and decrease the sugar… The spices & raisins would go well in a savoury dish as well, I bet. Hmmmmm. Olga: You could likely leave out the sugar and make this as a savory tart. I would double (or triple) the cheese inside and you could add some sautéed shallots or something to the chard filling. Good luck! And sorry, I didn’t want to sound negative: I just know that I don’t even need to try to feed people in this household chard-apple-tart. I’m kind of envious of those that will get to try this: I just don’t see myself eating the whole thing as well as cooking sth different for everyone else. 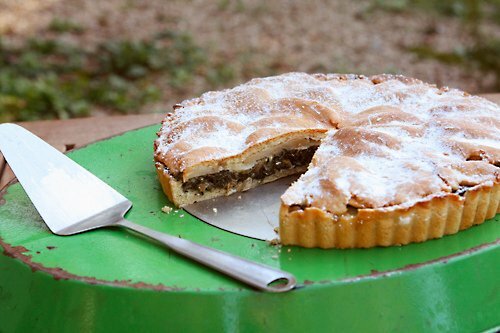 I had never heard of Tourte de blettes before and today I came across it twice. First, in a book I got this morning from a friend—an old French regional cookbook—and here. Hmm, is this the universe telling me I must make this tourte? Well, if I do, I’m definitely following your recipe David. Thanks for such an interesting recipe! Just a note with another idea about what to do with chard stalks: GRATIN. Boil them til tender, put them in a gratin dish, cover them in béchamel, and sprinkle with a mixture of bread crumbs, grated parmesan, and black pepper. Broil. I made this very same thing over the weekend! I love it with the pine nuts. Next time I will go more savory, but it’s out of this world! Anything I can do to get more swiss chard in my belly – yum! I can’t get Swiss Chard here so will have to make a trip to the US just to try out this recipe. Yum. We grew some super spectacular (and delicious) multi-coloured swiss chard in the garden this year…orange, fuchsia and yellow stems/veins. Ohhh, if only we’d planted more/not eaten it all. Everybody who loves chard should know that it’s very easy to grow, grows fast as any other leafy green, and at least in western Canada, where I grow it, not suseptible to pests. Buy a pack of Bright Lights (assorted colours, including bright red, lemmon yellow, or pale orange stems) as an ornamental, and if you cut from outside, they’re known as a “cut n’ come again” – will keep on from spring to fall. Thank you for such an interesting recipe – I love swiss chard! I wish I could have seen that enormous bunch of chard. How lucky you are to find chard the size of your bathtub! I am liking this way better than regular just becoz the crust is olive oil and not butter. I think my family is going to appreciate tart more now as they do not like the butter flavor much. I don’t like swiss chard but with the apples, raisins and other lovely ingredients I can eat this and would probably even love it. 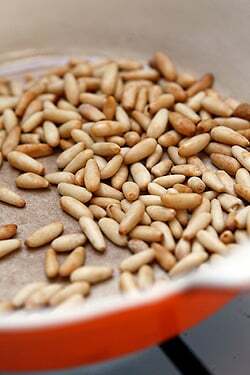 This recipe sounds SO interesting but I’m wondering what you substitute for the pine nuts – they give me the WORST case of agita! I am *so* in. This sounds like exactly my kind of crazy. Apples, parmesan, chard and nuts. Awesome. Laura Calder did a similar recipe without apples and an open faced pie which I did , I loved it but my family did not.. they thought the raisins were too sweet and odd with the swiss chard .. I am going to try this recipe with apples.. thanks for this! 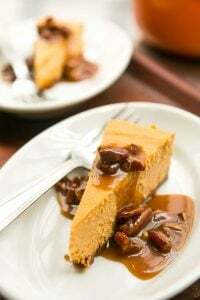 a fall dish which I wish I would have before today for our Canadian Thanksgiving for brunch! I can’t begin to tell you how much we enjoy your blogs, tweets,etc! My husband and I travel to France every year to explore different regions and are always pleasantly surprised by our discoveries. We plan to move to France as soon as we are able. Our last vacation took us to the Luberon region where we tasted the Tarte de Luberon. We brought one to our Parisian hosts who consumed it within seconds. Any idea where I can find the recipe? This sounds fantastic! I have plenty of swiss chard still in the garden. Now if only you’d come over and make this for me! Wow! What a surprise to see this tart on your website! 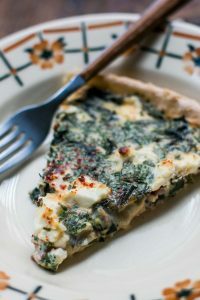 I have been making a Swiss chard tart as a brunch entre for years and thought I had come up with something unique. I see others have created one, too. Delicious, isn’t it? Thank you, David for a different recipe for swiss chard! We belong to a CSA which includes this lovely green vegetable in our basket every week. I’ll be making the tart this weekend. had a special Italian dining room. I had a dessert there that just knocked my socks off. It was Mille Flori (honey) and chocolate drizzled over vanilla gelato on top of a crispy stacked pastry like a Napoleon. Is it true that you can not get Napoleon pastries in Paris because of the history? I have been looking on line for Mille Fleur. Have you used it? It’s just nectar of the gods. Just forwarded this to my friend across the street. We’ll probably get chard soon here in NOLA. 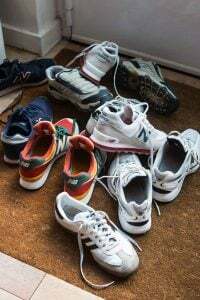 Washing it in the tub – it must not have been too difficult if your apartment is like that a friend had when she lived there. The “tub” was in the kitchen, about two and a half feet from the kitchen sink. I had a souffle in Paris when I was 19, served at someone’s house. It was a dessert souffle with bell peppers and onions and tomatoes. I watched her assemble it, wonderingly, but once it was served – amazing! Have you had such a thing? It may be best as a memory. Thanks; we’ll chard it up soon. Hi from New Zealand. This tart looks divine! When I was a kid chard was called silverbeet, everyone had it in their garden.It was served boiled to death, with strange lumps of soggy stems, sometimes with a floury, gluggy white sauce over it, and it literally made me gag. Now I grow it all over my garden, tucked between the roses, poking up from under the dill, and as long as I call it chard I love it. as soon as my baby spring plants get to plucking size, this tart is going to be on the menu. Your basket of apples reminded me of an unusual and delicious variety of apple I enjoyed last February when I was in Paris. The apple vendor at the PRÉSIDENT WILSON market in 16th Arrondissement called it a Patte de Loup. It was a flattened round shape, with a rough golden russeted skin. Most of the fruits had what looked like healed scars in their skin that made it look as if they had been torn by claws! The apple was nice and crunchy and sweet. I would love to find out if it’s possible to get some scion wood from this variety to graft onto one of my apple trees. Do you know anyone I could contact? (My French is pretty terrible!) Thanks for your blog, David, I really enjoy it! Bobbie: I doubt you can have apple scions shipped into the US (if that’s where you live.) 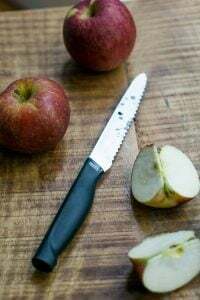 However there are companies like Seed Savers, as well as others, that specialize in unusual fruit and vegetable varieties where you might be able to find it. naomi: I’ve not had a dessert soufflé with peppers and onions. It may be something from Provence, but I’ve not run across it. Sue: Mille fleurs just refers to ‘multi flower’ honey, and can be found in many places. In Texas, there are lots of locally produced honeys and I’m sure you can find a nice one at a farmers market or Central Market as well. Places like Zingerman’s and ChefShop sell very good imported honey online. Stephanie: I don’t know what that is. But like I said, a lot of French cooking is regional and you likely need to be in the Luberon to find one to eat. I did a quick search on Google and found a few sites with recipes. Good luck! Annie: I also make lasagna with garlicy sautéed Swiss chard stems as the filling, instead of meat. As per Karen Brown, I’m also in NZ, and have “silverbeet” everywhere in my garden and would eat it several times a week at this time of the year. Last night with mushrooms and pasta, today the young leaves in a salad, tomorrow in fritters with ricotta. Yum. Never had it with apples though. No way—this tart sounds amazing! Love the savory-sweet combo. Darn, I had Swiss chard for dinner last night! And I have apples and pine nuts. Arrgh! Next time. I LOVE the story of the guy trying to sell you bok choy as Italian Swiss chard. That is hilarious, especially since bok choy is pretty difficult to come across here. devoted to serving movie buffs and foodies. Hi David. Here in the Central Tablelands of New South Wales, Australia silver beet, as it is called here, is practically being given away, It seems the most common leafy vegetable at growers markets, of which there are many. The stuff with coloured stems is locally called rainbow chard and usually comes from the organic growers. Silver beet is sold pre packed with the stalks cut off in vegetable stores and supermarkets (we have many of those too). Don’t like it very much but have actually made a tart like this before but it had an egg and cream custard like a quiche and wasn’t a great success. 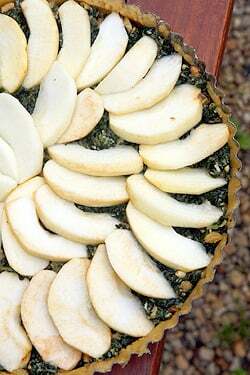 Was thinking of making the 12 desserts of Provence for Xmas eve, which includes a swiss chard tart like yours. Local butter is great for toast and sandwiches but really has too much water for baking; when I lived in Sydney I would buy French, Danish or Italian instead but they have become a bit expensive when local unsalted is $AU5.56 a kilo versus around $AU36.00 per kilo for imported. Only NZ butter we can buy is super churned for spreadability otherwise would happily use as I agree that it is good. Have often bought Irish butter when in London and it was closest in taste to Australian, especially the salted Kerrygold. Here I live with the water in the butter and buy ready made butter puff. If you go to NZ try Belgian Biscuits which I think are fabulous … but have nothing whatsoever to do with Belgium. This tart looks lovely–certainly a must try! Just wanted to confirm that you should not believe anyone who tells you that bok choy is Italian swiss chard (as an american used to having many international food available, this is surely obvious, but in Italy and I’m guessing also in France strange things happen when you start to ask for something that isn’t quite local). I live in Florence and having tried to cook some chinese food while here, I can assure you that the Italians not only don’t have bok choy (hard to find even in Asian corner stores), they don’t know what it is. Their closest approximation is bietola, a leafy-green that is kind of like swiss chard and kind of like bok choy but isn’t either. And in typical Italian fashion, they aren’t always willing to believe that bok choy is in fact not bietola and thus just doesn’t exist here (one can have a similar argument about cranberries, which are not the same as ribes). Swiss chard, on the other hand, does exist and isn’t too hard to find, but I’m not sure what it is called in Italian. There’s a book in that, regional specialties that the unsuspecting tourist would never know about. This swiss chard looks fantastic. And since I made my very first tart this past weekend, I will give it a go! Leanne: In Italy, they use a pasta frolla, I think, which is a sweeter dough. They also usually serve them open faced, at least the ones I’ve had. Lauren: I have a sneaking suspicion that perhaps the bok choy was just grown in Italy and that they were calling it that because they needed a name for it? I’m not really a bok choy fan. Harry: If your butter is watery, you can sometimes pound it while its cold with a rolling pin, which forces some of the water to the surface. Then you can blot it away. Kathy: A number of us have been scouring Paris for kale in the last few months to no avail. Mostly what I’ve deduced from one of the produce merchants is that Parisians don’t like bitter greens, although radicchio and frisée are fairly available. I don’t think they eat stewing green quickly sautéed in garlic like Americans or Italians, and prefer them au gratin or long-simmered (or sauced), although I could be wrong. I just haven’t seen them served any other way. If you hit some of the ‘bio’ markets or producers, you can often find interesting greens and vegetables that you don’t ordinarily see (called légumes oubliés, or “forgotten vegetables”). And even natural food stores often have interesting produce at prices less than the outdoor markets. I also did a post and listed some CSA organizations in Paris, that you might find interesting, too. I think you’ll find it quite easy to grow swiss chard (kale too) from seed in pots. Maybe something to try next spring on a balcony or roof garden if you’ve got one? The chard can be particularly beautiful in you grow one of the varieties with bright colored veins/stems. Chard and its other spinach ancesters are great because they offer really distinct flavour to any dish you put them in – and its really good for you. I often enjoy spinach in a quiche as it goes really well with the egg and cheese. I will certainly look at trying this recipe, although I might skip the tree climbing! Oh David! 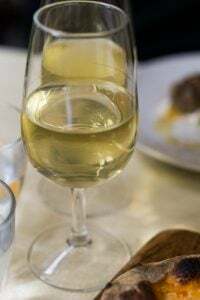 My curiosity and made me do it….try this recipe, that is, and I have to admit it was the most disappointing use of garden-fresh chard imaginable. The pastry needed either more oil or a bit of iced water to bring it together- another 1-2 tablespoons- but the family thought the addition of baking powder gave a great result. Wonderful ingredients- chard so sweet it really did convince me it would work in this recipe- sultanas plumped in alcohol, toasted pine nuts, grated parmesan- each was perfection in their own right. So where did it all go wrong? By being trapped together in a shotgun marriage overseen by the apples and the pastry. Surely a case of unholy deadlock if ever there was one! Reminds me of the time I sent my husband to the store for swiss chard. He and the helpful store employee searched all over the cheese department for it! Silly. Naturalia has had chard fairly consistently over the last few weeks. Not cheap but not outrageous, if you’re ever in the lurch. I’ve been using the leaves for tarts too; the stalks are really nice if you toss them with a touch of honey, a bunch of lemon zest, some lemon juice and some oil and let them cook slowly for twenty to thirty minutes, sort of a chard confit. I actually have Swiss Chard growing in my garden. I have so much of it, I don’t know what to do. Unfortunately, I am a 40 drive from Paris. Thank you for this recipe. The apples on my tree are ripe and my chard is ready to go! 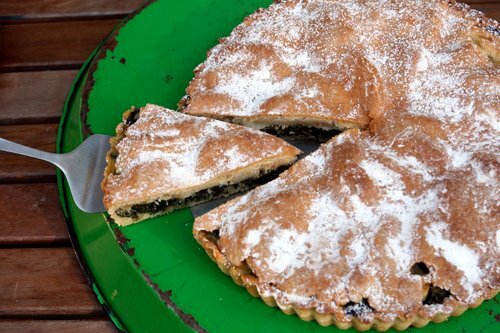 David, Torta di verdura with swiss chard is typical of the Lucca region and if one can’t be bothered to bake one, the local bakeries display a large selection of torta di verdure in their windows. They’re made with a sweet pasta frolla base and they’re open faced to show the green filling, which also includes raisins soaked in vin santo. Extra pine kernels decorate the top. Some bakers’ versions are a bit excentric as half of the flan has a swiss chard filling while the other half can be chocholate and pear. I don’t know who was originally responsible for this evolution. About swiss chard, which I understand has nothing to do with Switzerland, here in Tuscany it is found in a couple of versions: the common one is called bietola, which sounds like blette in french, but there is also a nicer version called bietolina which is smaller and without the big white stalks. David, as I’ve said before, I LOVE your blog. And, lugged your new (heavy) book back from our trip to NY (alongside Ziplocs and dried cranberries)… am going to bake brownies and choc chip cookies from your book for a Tex-Mex in Italy dinner with american and italian friends next week! Finally, I can comment on one of your posts with some knowledge. Torta di verdura here in the Liguria region of Italy is savoury, as you stated, and often may include mixed vegetables, artichokes or, the most traditional, swiss chard (as per enzo, bietole or bietoline) and ricotta. In Liguria, even the crust (pasta sfoglia) is savoury: just flour, very cold water, olive oil and salt (although Gualtiero Marchesi substitutes butter for oil). For the dough: mix flour and salt, make a “volcano” and in the center add olive oil and water. Knead well until soft and elastic. Form 6 “dough balls” and set aside to rest for 30 minutes under a clean cloth. When ready, roll out and lay over lighly oiled metal pie tin. For the filling: Boil or steam the swiss chard, squeeze out excess water and chop. Chop leeks. Saute the leeks in (very little) oil and (drop of) water then add swiss chard. When just browned, let rest on paper towels to absorb excess oil. Beat eggs separately. Mix vegetables, eggs, ricotta, parmiggiano, pinch of salt. Add filling to dough, pinch down border (open face tart) and bake in oven at 180 degrees C for approx. 40 minutes. I was sent to your website for the first time, yesterday, when looking for a new recipe for swiss chard. Thank you, my good friend, Ellen for this lead and most of all — Thank You David — it was fantastic! You have a new fan! How it went…I harvested from my own garden brilliant greens and used (along with the recipe as designed) what I had on hand, including toasted walnuts (instead of pine nuts) and brown sugar (instead of raw – although I reduced this ingredient by half). When it came out of the oven it was a poem! The pastry was flaky and golden (and with a little more olive oil to bind it — not too hard to roll out in cooler temps); the flavors were so unique — it is a great combination! Friends who stopped by where in awe of this tart and stayed to enjoy a small meal with wine. My daughter, Fiona (at 7), was your biggest fan – relishing each bite of her two slices. Merci! It was just a wonderful change from simple sauteed greens with garlic or shallots. 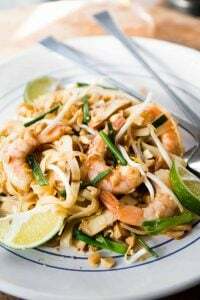 I have stored this recipe in my favorites. Looking forward to cooking with you again, soon! Hi David … that tarte looks absolutely scrumptious ! Yum ! Wish I had a slice right now ! Hope you’re having an easier time finding ‘blette’ now that it’s a bit more in season … although like many things here in Paris, it doesn’t necessarily mean it’ll be consistently available :) I just scored a whole bag full this w/e @ Batignolles. Ha ! And glad to know I’m not the only one enjoying those less than conventional flavor combinations … I made a very similar provençal recipe using red chard during the cooking classes I was giving years ago … & fortunately there were no complaints from the tasters ! That savory /sweet combo from Mediterranean cooking is also part of one of my family’s favorite dishes: pasta with cauliflower, pine nuts, raisins & a pinch of saffron. Mmmm ! Enjoying your posts as always ! Bonne soirée et Bon courage with the manifs & grève ! Excited to try this recipe, but I tried the dough and it’s very dry. Is there some water to be added? Strange, as I am in the US and used King Arthur flour! I read and re-read the (few) ingredients to make sure I didn’t do anything wrong, but I’m not sure why it was so crumbly. I did add about 1/4 c water before you posted an answer and it brought the dough together, but I haven’t put the tart together yet so I don’t know how it will taste. Thanks David–looks wonderfully savory for fall and inspires me to ask a question about a search I’ve been doing for another savory crusted dish. 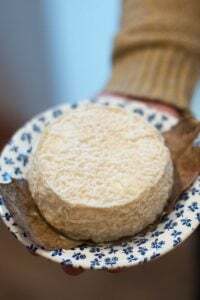 I was in Bandol region at a family farmhouse restaurant this summer and had what I’d best describe as a cheese souffle baked inside a double crusted glass pie dish. 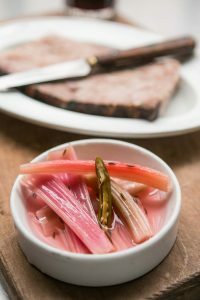 I’ve been searching for a recipe for something similar but can’t find anything that sounds close. I took pictures and know it had a top and bottom crust and seemed to have just a cheesy egg filling that rose and lifted the top crust above the edges of the pie dish and stayed risen but incredibly light even after cutting into it-any suggestions for how to make a souffle-like filling sturdy enough to rise inside a pie crust? I just happened to be making tourte de blettes when I found your blog. I love it! (your blog and the tart!) I first had it in Nice some years ago and enjoy surprising unsuspecting people with the unusual flavour combinations.I have a glut of silverbeet (as Swiss chard is called in Australia) so am trying to use as much as possible before it all runs to seed. The plants are now over 1 meter tall. We have just put new plants in for next season. Our climate in Tasmania is perfect for silverbeet. In fact, I would say that most vegie gardens here have it. David – Love your blog and its recipes. Do you ever make tarte aux oignons? I would love a good recipe of yours to imitate or just some guidance in adapting another. Because most cookbooks are just echo chambers of stuff other people have written and I would trust your recipe. Thanks! No I haven’t made one, but the Provençal version is caramelized onions and olives, and perhaps some good anchovies, spread over puff pastry and baked.